The Sounds of Fifes & Drums. Driving along the beautiful Colonial National Parkway along the York River toward Yorktown one can almost hear the sounds of fife and drums, regimental bands and the blistering sounds of a cannonade. Yorktown, the pivotal battle in Virginia which caused British General Cornwallis to surrender his army to combined American and French forces led by George Washington has a whole new sound. The sights and sounds of visiting Revolution history live! The American Revolution Museum at Yorktown. With the recent opening of the American Revolution Museum at Yorktown, an 80,000 square foot building added on to the original 1976 Yorktown Victory Center Museum, featuring expanded exhibit halls and galleries one can do just that . 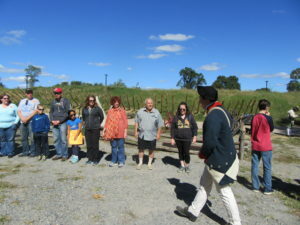 New and expanded Education areas bring a new and dynamic dimension to interpreting the battle for the colonies successful effort from 1776 to 1783 to become independent of Great Britain. 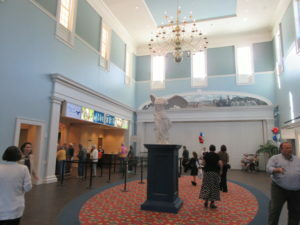 The famous marble statue of “Winged Victory” greets visitors in the entrance and grand vestibule hall at the American Revolution Museum. As you take your first steps into the beautifully renovated vestibule and lobby of the American Revolution Museum to purchase your tickets, begin your experience by exploring the Gift Shop before or after your visit, as you prefer. There is also an indoor/outdoor casual Museum Cafe just off the lobby to enjoy some downtime and treats. 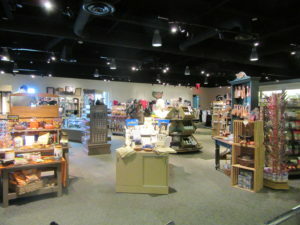 A well stocked brightly lit gift shop has all you could want for souvenirs , books, something for everyone at the American Revolution Museum! Now the Revolution history begins. Opposite the gift shop is the Museum Theater where a short film “Liberty” will highlight the experiences of everyday colonists and patriots during the war via a storyteller who with the help of a moving panorama that is vibrantly illuminating and adds reality to the story. Another stunning gallery at the American Revolution Museum. Leaving the theater you start the walk down Revolutionary Hall where a timeline of events will lead you to the five permanent galleries in addition to the one changing gallery. Featured in the permanent galleries are incredible artifacts relating to the British and American Empires,the changing relationships between the two adversaries, the Revolution itself, the American people and the New Nation. 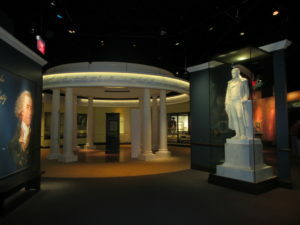 Thomas Jefferson invites you into another gallery in the museum at the American Revolution Museum. Do not miss the photographs on the hall walls as they are unique photos of people who actually lived and fought through the war and in some cases their remembrances. You may be of my mindset thinking photos of Revolutionary War participants did not exist until we remember that by the 1840’s or so photography, even though in its infancy, was able to capture some of the survivors in real time for all time! In the Revolution Gallery, do not miss (I’ll say “do not miss a lot!) the opportunity to immerse yourself in a spectacular experiential theater that invites you to watch, listen and feel the sounds of the battlefield including wind, smoke, and cannon fire in a panorama setting. You will want to go twice! Outside the theater is a truly one of a kind exhibit piece that has a hologram of different people from the period like American Dan Morgan, a legendary leader of the Virginia riflemen, as well as Patriot nemesis Banastre Tarleton. Leaving the gallery area you will go outside to the investigate second half of this enlightening museum that being the Living History encampment of soldiers and a Revolutionary period farm. 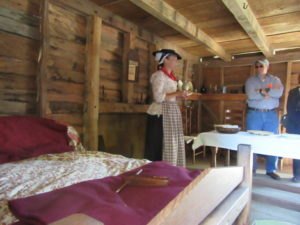 You can engage if you like, docents and period dress re-enactors all highly informative. At the soldier’s encampment, I participated in marching drills and charges. Even espionage! 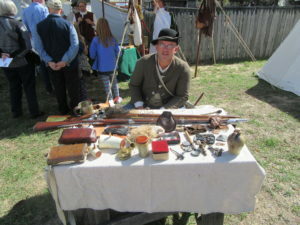 Talk with and learn the many skills required to survive everyday living back in the day such as care and maintenance of weapons from expert volunteers. At the farm one can delight in the vegetable gardens, raising chickens or learn about table manners when dining in the 18th century to crafts from weaving to cooperage. Baking and cooking are demonstrated and it’s fresh fare for the troops and farm workers. In early 2017 there is great news coming. Both the Soldiers Encampment and the farm areas will be greatly enlarged with many added features. The new farm areas will include the living history recreation of the Edward Moss family farm, a real life family which will emphasize day to day living on a colonial-era farm including the lives of enslaved African Americans of which the Edward Moss owned six. Learning the eating habits and manners of a farm family will bring some real surprises to you thinking of daily living in colonial times! Another new and exciting addition to the outdoor living history will be an amphitheater to hold 250 people. The amphitheater will take the appearance of a redoubt (An earthen mounded defensive position.) where artillery and other pieces of Revolutionary War period armament will be on display and presentations including hands-on tactics for using the weapons. 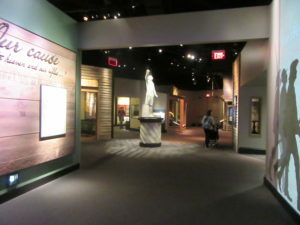 The American Revolution Museum at Yorktown is part of the triad of geographically closely related and historically important sites, the other two are Colonial Williamsburg and the 1607 Jamestown settlement Historic Jamestowne. All three are unique in their history and perspectives offering a broad range of interpretations. 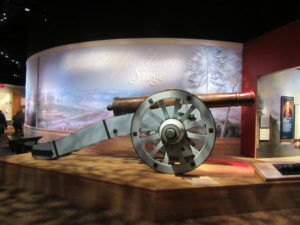 “Lafayette’s” cannon on display at the Colonial National Historical Park Museum. 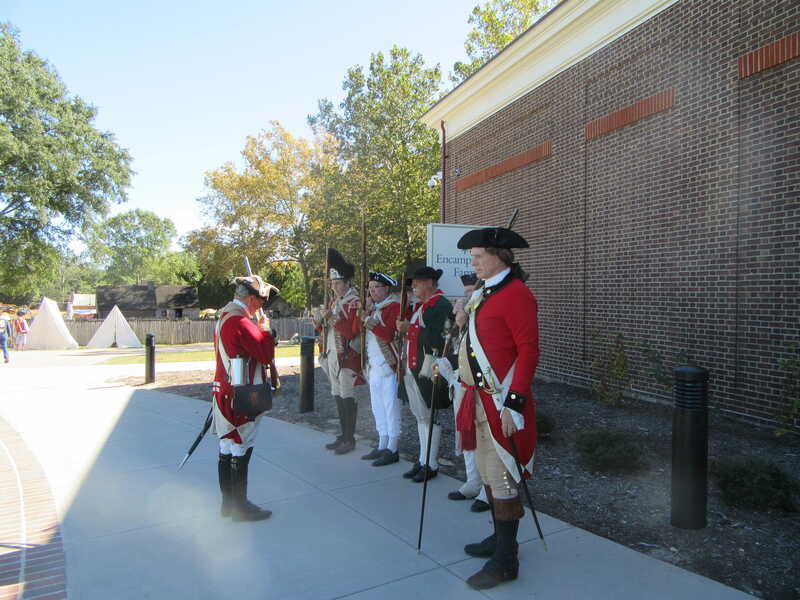 While in Yorktown be sure to visit the Colonial National Historical Park at Yorktown, visit their museum and take an auto or bike tour of the battlefield as well as a guided walking tour of the historic district in the village. Follow the trail that led to freedom! 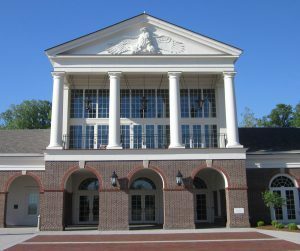 You can park your car at the American Revolution Museum or the Colonial National Historical Park and take a convenient bus that runs in a circle to the two museums and the shops in Yorktown. There is a quaint shopping area, places to eat or just stroll along the beautiful James River. Lodging is readily available whether it be Bed and Breakfast, Inns or traditional hotel/motel choices. Important dates in early 2017 are March 23-April 4 when the official grand opening of the entire site will take place including the completed Outdoor Living History Program and the expanded Continental Army encampment. If you love or want to learn more about the history of the United States, one cannot pick a more vibrant area to explore, experience and hopefully understand why and how America has become the place that it is. The Revolutionary War Museum at Yorktown is a grand place to start. I would allow a full day to explore the Revolutionary War Museum, the Colonial National Park, the battlefield, and downtown. Perhaps two days if American history is your passion. If other travelers in your party get weary they can easily take the bus to Yorktown and relax on the riverfront. Multi-attraction tickets good for more than a day are available. The museums are totally accessible for wheelchairs and scooters while the battlefield is a lot of walking through fields and some small hills with occasional boardwalks. The living history areas were a little rough on the paths at the grand opening but I’m sure they will be accessible in 2017. Contact them if you have other special needs. There is a great deal of walking involved so wear comfortable shoes and carry water. 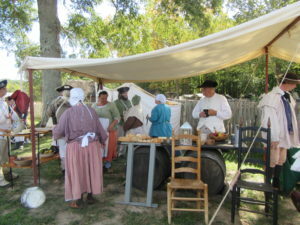 All sorts of re-enactors are located throughout the American Revolution Museum and grounds to demonstrate daily activities as in this particular case, weapon inspection.